Silk filled and silk covered. Covered in either silk habotai or silk satin and filled wtih the finest handpulled mulberry silk floss. Doubly silky comforters. For extra warmth this winter, try sleeping with any of these amazing Egyptian cotton sheets or may we suggest Tencel® Lyocell. Using only the finest quality down fills, washed and processed in the U.S.A., and covered with world-famous European downproof fabric, all DEWOOLFSON DOWN pillows are sewn, filled and finished within 48 hours for shipment from our North Carolina factory. Choose soft, medium, or firm, or have one stuffed to your heartâ&#x20AC;&#x2122;s content! If your DEWOOLFSON down pillow is not perfect, return it for adjustment . . . any time within one year of purchase, charging only for additional down. blankets It's cold out! Our diverse selection of blankets will keep you comfortable. Choose from some of the most luxurious blankets found anywhere . . . from the U.S.A., Italy, Portugal, or Switzerland, in cashmere, wool, modal, cotton or down. From $84 to $3000. downfeatherbed DEWOOLFSON's own support featherbeds are unlike most all others. We create ours from a specialized European twill fabric chosen for its durability and strength. Constructed in a complete baffled box pattern with DEWOOLFSON's own unique valve system prevents the fill from shifting. Filled with your choice of our white goose down and feather blends, with considerably more fill than most. 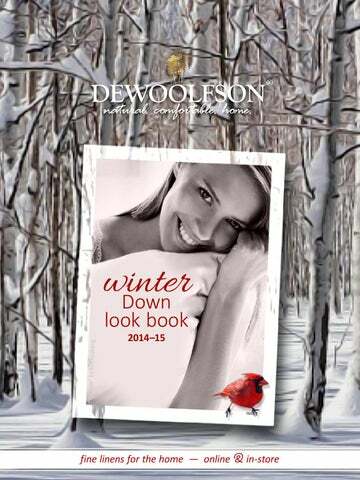 at dewoolfsonlinens.com – the perfect and easy way to create a wishlist for yourself or someone else when those special occasions arise. the perfect gift for that oh−so−dear, yet hard− to−buy−for person in your life. You decide the amount and we will send them our special card. Simple and sincere. © 2 014 D E WO O L F S O N D OW N I N T ’L ., I N C .